Pura Vida Ministries is a non-denominational Christian outpost mission for the Gospel, based in Nosara, Costa Rica and administered in Fort Pierce, Florida. Since 2004, Pura Vida Ministries has hosted more than 72 mission teams and more than 1,500 individual missionaries, actively dedicated to living out the Great Commandment and Great Commission in the immediate local community of Nosara, as well as its neighbors throughout Costa Rica, while touching the lives of individuals from all over the world. Pura Vida Ministries accomplishes its mission by serving local and regional churches and the local community in general via an alternative, contemporary ministry. 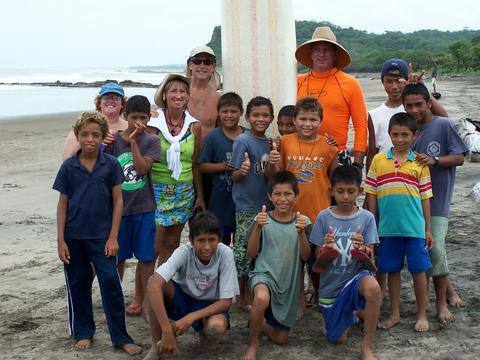 Pura Vida Ministries provides a bi-lingual Christian center of worship; community outreach, retreats and projects, as well as surf missions. Dr. Terry L. DeAngelis, (aka “Teresita”) (link to About Us page), conceived of Pura Vida Ministries while en route to a surf mission in Nicaragua. Teresita DeAngelis has an impressive resume that includes Degrees in Religious Studies, degrees in Social Work, a Registered Nurse (RN in Interventional Cardiology), as well as being an Ordained Minister from the Evangelical Bible Seminary in Florida, USA. Pura Vida Missions and Missionaries stay and work out of the simple comforts of Bella Vista Mar an exquisite, modern center, walking distance from the beach, Playa Pelada, with such luxuries as air conditioning, a swimming pool, and wi-fi access. Pura Vida Ministries runs year-round (except for the month of October-- when the rains are bad!) All ages welcome! Pura Vida Ministries is a registered non-profit ministry in the State of Florida. For more information about how to participate in a Pura Vida Mission or contribute, here in Costa Rica, please visit the FAQ page for more details!